L6 A-level Drama students have been preparing a performance for their Practitioners in Practice module based on the stimulus ‘Monsters’ by Niklas Radstrom. This is a very sensitive text that is based around the awful kidnap and killing of Jamie Bulger. Students tackled the task sensibly and were able to develop the appropriate atmosphere that shows the sequence of events that happened during that awful day. Students will continue to work on this text over the next term culminating in a 45 minute performance showcase. 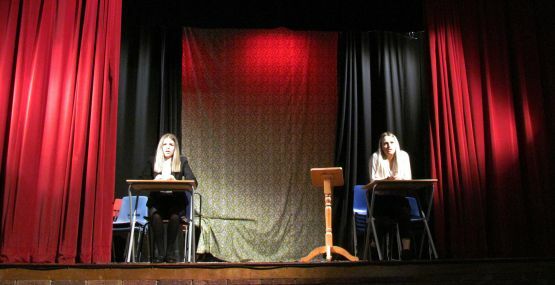 Students and teachers were very impressed with the performance, the students commanded the stage and delivered a difficult text with confidence and maturity. Find out more about Drama A-level at Highclare Sixth form here.